The colorful, long-lasting blossoms of crape myrtle (Lagerstroemia indica) make it a showpiece in classic Southern gardens. But it is not a particularly delicate plant and it can thrive in conditions that would be a challenge for other plants. Crape myrtle's seed pods remain on the tree into winter. Crape myrtle grows in the form of a multistemmed shrub or a small tree, typically reaching 15 to 25 feet tall. Small varieties can be used as foundation plantings, and larger types can serve as focal points or shade trees. It's not attractive to deer, so it is a good choice in areas where damage from browsing animals is a problem. Ancestors of the modern crape myrtle were natives of southeast Asia, and in the U.S., the plant has naturalized throughout the South. It is hardy in U.S. Department of Agriculture plant hardiness zones 6 through 9, and in some cases it might survive in USDA zone 5. In climates colder than USDA zone 7, injury to branches is common during cold weather, and if the temperature falls below minus 5 degrees Fahrenheit, the plant may die back all the way to the ground. Crape myrtle is relatively undemanding in its soil preferences. It prefers well-draining soil, but it can grow in sandy, loamy or clay soils without trouble. It fares best when soil pH is slightly acidic, with a pH level between 6 and 6.5, and it flowers best in soil that is not rich in nutrients. Crape myrtle can grow in partial shade, but it will flower much more reliably and profusely with at least eight hours of full sun each day. Crape myrtle's long bloom period is one of its most attractive characteristics, and given the proper growing conditions, the plant will be covered with flowers from midsummer into fall. Crape myrtle blooms on new growth, so the best time to prune is in late winter or early spring before new growth and flower buds develop. Pruning in the fall is a bad idea because it will encourage late-season growth that is more vulnerable to cold injury. Prune with sharp pruning shears, dipping the blades in isopropyl alcohol or bleach after each cut to reduce the risk of transmitting any infection that might be present. 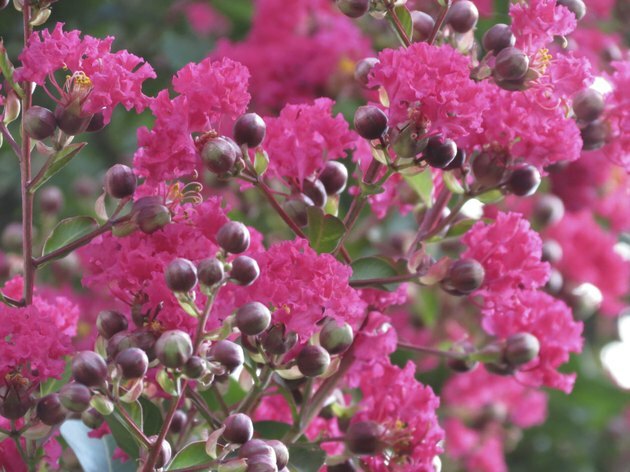 Overfertilizing crape myrtle with nitrogen can reduce flowering because it causes the plant to concentrate on leaf growth instead of bloom development. To fertilize established trees, apply an 8-8-8 dry garden fertilizer in the spring, broadcasting it around the tree or trees at a rate of 1 pound per 100 square feet. Water the fertilizer in well after spreading it. Should I Plant Lantana Plant in Spring or Fall?